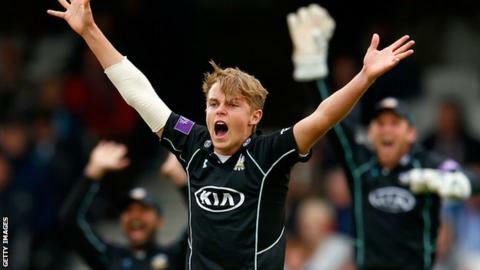 Surrey all-rounder Sam Curran has signed a new three-year contract, keeping him at The Oval until the end of the 2018 campaign. The 17-year-old made his first-team debut in June and received an England Under-19 call-up last month. "I've had a great summer and look forward to coming back next year as a full part of the professional squad," he told the club website. Sam's brother Tom, 20, signed a new three-year deal with Surrey last week. "Between now and then I will be spending time on my A-levels, as well as preparing with England and hopefully earning selection for the Under-19 World Cup." Sam, who studies at Wellington College in Berkshire, is the son of former Zimbabwe international Kevin and only made his first-class debut in July. The left-arm fast bowler made an instant impact, taking 5-101 in the first innings against Kent on his debut, and picking up 22 wickets as Surrey won the Division Two title. He also scored 239 runs at 47.80 in his six Championship appearances as Surrey returned to the top flight of the first-class game. Curran also contributed 15 wickets in the One-Day Cup as Surrey reached the final and picked up seven scalps in the T20 Blast. "Once Sam finishes his A-level exams next year we look forward to welcoming him on to our playing staff as a full-time professional," Surrey director of cricket Alec Stewart said. "I've already gone on record stating that he is the best English 17-year-old cricketer I've seen. "I'm convinced he will have a very successful career with both Surrey and England."